This file is four weeks worth of lesson plans for ages Baby-5. It covers desert week, Easter week, sky week and farm animals week. 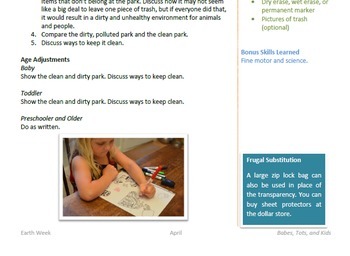 There are worksheets, cut and paste activities, and more. Find vocabulary words, fine and gross motor activities, activities for color, numbers, and letters, and fun crafts. The first page includes a grid to help follow the plans, supply lists, and suggestions for organizing. The work has been done for you! Where applicable, we included frugal tips to help make it manageable for all budgets! Babes, Tots, and Kids by April is licensed under a Creative Commons Attribution-NonCommercial-NoDerivatives 4.0 International License. Based on a work at http://www.babestotsandkids.com/. Permissions beyond the scope of this license may be available at http://www.babestotsandkids.com/.